You’re in need of a new car. Should you buy or lease? Financially speaking, buying a car could be cheaper in the long run. All you have to do is pay off the loan in full and keep the car for a few years. Conversely, leasing will be less expensive on a monthly basis. With leasing, you can also get a new car every 2-3 years. What option is better? Both have pros and cons, and ultimately the decision comes down to your financial needs and lifestyle. The team at LendingArch is here to give you insight along with providing advice on whether or not you should buy or lease. Are you looking to drive the same reliable car for many years? If so, buying might be the best choice for you. Plus, with buying you can enjoy your car for a few years with zero payment! That’s something people tend to forget about but it’s a great benefit as the amount that went to the monthly payment can be used for another purpose (such as that European cruise you’ve been wanting to take). Do you need a fancier car for work? Leasing is a way that you can afford that upscale car without breaking the bank. Plus, in some situations you might be able to use it as a tax write-off. Choosing to buy or lease all comes down to personal preferences and priorities. We also recommend trying out a car payment calculator to compare leasing and buying payments which can provide insight into what you can afford financially. This will also allow you to be prepared when it does come time to talk about financing options. 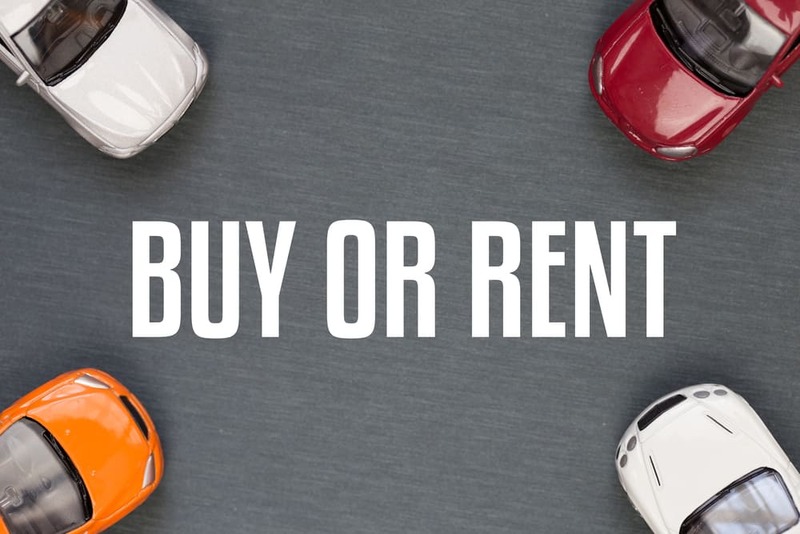 Now without further ado, let’s dive into specific pros and cons of leasing vs. buying a new car so we can help guide you in making a decision. One of the best pros to buying is that your car is your own. You can add-on packages and even modify it to meet your exact needs. Surprisingly enough, you will be able to save more money in the long-run when buying a car. There are zero penalties. You can drive as much as you want so if you’re planning a summer roadtrip, you can feel at ease knowing you can drive your car all across the country. You can sell the car whenever you see fit. Whether your lifestyle needs a shift or you want a newer version, selling your car is completely up to you. Additionally, when you do sell your car you can use it as a trade-in on your next car. This will help you to save money on your next vehicle purchase. You’ll have to pay a much higher down payment. Financially, this might not make the best sense. It could also mean that you’re saving up for years before you can afford to buy new. Similarly, no matter how much your down payment is your monthly payments will be high too. While new cars do come with warranty, once that expires, you’re responsible for all repair costs. If you don’t plan ahead and save accordingly, one bigger repair could land you in debt. When trading in your car for a new one, there are a variety of selling hassles that could get in the way. Some can even prolong the buying process. Lastly and most importantly, the depreciation value is great. Within the first year, cars lose 50% of their MSRP value. Oftentimes, when buying a new car people tend to focus on the actual price or MSRP of the car. While this is something that should be looked at, what’s more important is looking at the car to make sure it will fit your needs and you aren’t paying too much for it. Another item to look at before buying a new car is the financing terms. According to Edmunds, one of the biggest regrets car owners have is with their car loan. The wrong loan can actually cost you more than the savings you can get when negotiating the total price of a new car. Calculating payments with a car payment calculator before you step foot into a car dealership can help you determine what car will best serve your financial needs. Did you know that the average person spends about 10 hours shopping for a car? Since this is one of the biggest purchases you’ll likely ever make, it’s very easy to try to find the “best deal”. But those precious hours spent researching and shopping are valuable. Think about it this way, what is your hourly rate? Let’s say that it’s $20 per hour. If you spend 10 hours shopping for a car, you’ve invested $200. The more time you take, the more expensive your car will be. Lastly, a big mistake often made is not realizing the full cost of ownership. The average length of car ownership is usually around 5 years, meaning that you’ll have to make this big investment more often than you might anticipate. Additionally, you should also consider the potential rise of gas prices and ongoing costs such as insurance, maintenance, etc. A huge benefit to leasing a new car is that you will have both lower monthly payments with little to no down payment. The upfront costs definitely won’t break the bank. Lease monthly payments are less than if you were to buy. This not only means you can save money but you can afford a better car – maybe even the car of your dreams. Included in lease deals is a great warranty plan. Any repairs both big and small that need to happen over your lease will mostly likely be included in the factory warranty. If you do have some repair costs, they will be minimal. You can get a shiny new car every 2-3 years. This also allows you to try out different automakers and vehicles. Think about it, in 6 years time you could drive a convertible and SUV to see what vehicle fits your needs and lifestyle best. There will be zero trade-in hassles. Additionally, the process from ending to starting a new lease will be very smooth. Much smoother than if you buy. Lastly, with leasing, you will pay less sales tax. For starters, you don’t own the car. You have to give it up at the end of your lease. Of course, you will have the option to buy it but for those 2-3 years, you’ll probably be more careful with your driving since the car isn’t yours. Mileage will be limited to a certain amount per year. Usually you can get a good lease deal with 10,000 miles per year. If you go over your miles before your lease is up, you’ll have to pay an extra fee when turning it in. Leasing agreements are long, can be complicated, and feature unfamiliar terminology which means you might be signing up for something that could provide a hassle down the road. Over the lifetime of your lease, you will probably pay more for it than if you were to buy. Another fee you could face when turning in your lease is wear-and-tear charges. These can be quite costly, especially if you aren’t expecting it. Should you find that your leased car isn’t meeting your needs, it will be very expensive to break your lease early. Car dealers like to advertise a low monthly lease payment; however, sometimes that’s coupled with a huge down payment. Most of the time, consumers don’t feel as if they can get a better deal. That is not the case. There are plenty of lease options out there where you can pay $2,000 or less. Sometimes you can even find good deals where nothing is required as a down payment. Similarly, car companies can also advertise low payments because it’s combined with a low mileage limit. To avoid any extra fees, it’s important to determine your driving habits and calculate your monthly and yearly mileage. Plus, when negotiating your lease, you might even want to add more miles than you plan on driving that way you’ll be covered in case of an emergency. The drawback to this is that your monthly lease payment will rise. While it’s true that most leased cars have an excellent warranty, typically that period ends at either the three-year mark or when you hit 36,000 miles – whichever comes first. Make sure that your lease term either matches or is shorter than the warranty period. Otherwise, you could end up paying more and be responsible for maintenance and repairs costs. Whether you choose to buy or lease, in just a few short minutes, you can be approved for a car loan. Plus, within 24 hours, you’ll be on your way to a car dealership to find the best car for your needs. Pre-approval: Within just a few minutes of submitting the LendingArch application, you’ll receive a pre-approval that will list out the loan amount and interest rate. Call with LendingArch: To finalize the loan process, one of our team members will call you about a loan and car dealership details. Once you choose the car dealership, you can finish the loan process there. It’s as easy as that. In just a few short steps, you’ll be well on your way to getting a new car!